Keep this unique compendium of advice with you at all times. Buy and show your support for The Simple Project. Let us simplify the world. For the first time, get all proven career & self improvement advice distilled from 500+ greatest books in one book. These 290 useful guides (across 13 skill categories) answer all the important questions on how you can succeed faster in any career, and in your life. A must for every professional, fresh graduates or experienced, and everyone else. Soft skills for every professional. For most professionals, learning to to the 'job skills' (engineering etc) is the easy fun part. The hard parts are dealing with colleagues, bosses, clients, dealing with the dreaded HR, maintaining productivity, working at one's financial security, surviving the difficult phases in life and doing things you may not be always comfortable with. This 'all in one' is here to help. Pramit Singh, the man behind The Simple Project, has tried to create an all-purpose collection of advice, aiming at professionals at all levels, although I suspect this book is most essential for those just starting out in their professional lives. I like that '200 Things...' also covers other eventualities such as freelancing and entrepreneurship. No wonder there are 290 guides, some one page long, other srunning to 10+ pages. It is an easy read overall. Keep this with you at all times. After all, it is a PDF. The book I wish I'd had read 20 years ago. I have built quite a library of self improvement books, Napoleon Hill, Dale Carnegie...right down to Tom Robbins, Deepak Chopra and so on. Coming upon '250+ Work & Perosnal Skills Made Easy kind of makes me feel I wasted my money. Instead of fluff anecdotes, repetitive ideas and regurgitations, this unique compilation just gives you breezy summaries of the best bits of advice. Most of the time it works and I think it is because of the 'encyclopedia' nature - just click on any guide when you need. I just hope they had organized the guides different, putting freelancing and making part time money in the end. But, it is a good start. We needed a replacement for the thousands of self improvement and career advice books in the market. I really wish I had bought this if it was available 20 years ago and saved myself money and time. Read this even if you don't like self improvement and career advice books. I am sceptical of all self improveemnt books and I find most career advice common sense enough (we don't need books for all that). But '250+ Work & Perosnal Skills Made Easy is much better than what I was expecting. 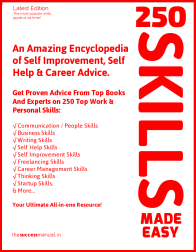 I found the sections on career advice (the workplace survival section'), self improvement guides and self help guides outstanding. These three section alone will save you from ever reading any blog post or book on the topics again. The section on 'making part time money' could have been better with more details, but this being an encyclopedia of sorts, I guess it will do. Pramit Singh of The Simple Project has divided this encyclopedia into 13 sections with 290 guides in all - some small guides, and some very big (I am talking about the career planning guide, which makes the parachute and pathfinder books redundant). Being in PDF form means you can carry it in your smartphone and click on the topic for a quick refresher when you need to. Did I add that there are no self-important anacdotes,new phrases mumbo jumbo and repeated advice? My personal favorite is the section on 'Productivity and Time Management'. This section alone blows away 100+ books, if we are counting books. I only wish we had some charts, tables and images. Maybe the next version of this encyclopedia will have those. A nice effort to simplify advice, overall. For a successful, balanced career. My definition of a balanced career: Doing what you love, what you are good at, getting good money for it, getting along with others in your professional life and being able to deal with the tricky issues that come up in everyone's life. This collection of advice tries to address all these concerns of a professional, and with its easy-breezy guides seems to succeed at it. At a mid-level in my professional life, I still cannot fully grasp the importance of professional networking, and this book nails this one. I also like the quick guides to today's fashionable topics such as grit, mindset, willpower and others. About time we had an all-in-one resource. Overall, a solid book for all professionals. I have referred to this book, which I have on my phone, a number of times, and it seems to give me a nice enough overview of the topic I am seeking advice on. Some might find the guides ''too quick' but then I would remind them that most advice on career and personal excellence is common sense, and this collections points this important fact a number fo times, actually. I think the point of this book is to cover a lot of skills in a well-rounded coverage. I think this book succeeds at that. I will no doubt refer to the compilation a number of times in future. The missing manual to success. I guess 'The Success Manual' could easily have been called 'the missing manual'. This collection of essential advice is a practical guide, covering all aspects of life of a modern professional. If you are stuck in your career or lack motivation in your life, or need some urgent bit of advice to put your professional life on a path of succeess, this book might have some useful answers for you. This book goes into depth about useful business skills - most of us are always wary of sales and marketing skills, but the business skill guides summarize the important part of the skills. Another favorite part, as others have also pointed out, are the comperehsive collection of productivity and time management methods. Overall, a must read if you are starting your professional career in a tough economy. I've recommended this book to my friends and colleagues. I've recommended this book to my friends and colleagues. It contains an insane amount of useful tips which have been sourced from the top books. Unlike other authors, Pramit Singh of The Simple Project has honestly said this and it helps that the book is in the encyclopedia mode. There are some 'cute' sections in the book - the lists of useful things everyone should about money and health, for example. They have never tried to push their own ideas and experiences. Just needed some more copy editing, that's all. But a good beginning, nevertheless. The book statys true to what it says in the blurbs, best advice from the best books. Other than quote collections and book summaries, there was nothing like this in the book market before, I believe - an 'encyclopedia of advice'. Do not even hesitate to pick this book up, it is a must read! This is a book that every professional, either new one in the arena or an experienced manager, should read and keep on hand. There is a lot of great advice from the top books ranging from productivity to handling office politics. What I found most useful were the guides about building yourself as a brand, professional networking. I also liked the guides for creative people. Not all the book will be relevant to your needs right now, but this unique encyclopedia will have something for you every single time. Although most other reviewers of '250+ Work & Perosnal Skills Made Easy have not talked about it, I found the 'Business skills' sections especially useful. There is a ton of mba-style information made simple over there. Pramit Singh has also summarized the best advice from Peter Drucker, and I have always found Drucker's business advice cutting straight to the bone. For professionals, there are all the personal marketing and career skills, in one place. You may have known many of the things mentioned here, but the all-in-one format has something for everyone. I am sure future versions will have more images and graphics but kudos to The Simple project for trying to create something different in the books area. Perfect for readers at all professional stages. If you don't know already, soft skills are critical to anyone's career success. Without it, your opportunities will be limited. Practical advice is delivered in a breezy style. There are 290 of these guides in here. I wish I had this as a college graduation present. This all-in-one resource is going to be great book for anyone just starting their first job, just to create awareness of the importance of a wholesome knowledge of skills that one needs in a career. Since finishing this book, I've often thought about 'Office Politics, and 'personal branding'. I'd highly recommend it. This would make it an essentail part of every college library. Expect no breakthrough ideas in this book. But do expect the best advice from all-time books on a whole lot of important career and self improvement topics. A solid coverage of the basics. People skills have been covered well here - networking (be valuable to others), public speaking, social anxiety, shyness, self esteem and whole lot else have been covered here. 1) Good collection of advice on how to be a people person. how to manage your career. 2) Good collection of advice on how to find a job, get a job, keep that job and survive the jungle that a typical workplace is - office politics, etc. 3) Good collection of advice on many kinds of skills, and there far too many of theme here. 1)You can't really learn any skill by reading a book. You need to apply the concepts in this book on a regular basis, and that's when the real learning happens. 2) Some guides would be better with more details. 3) There are some copy errors. This book not only covers all the skills that help you get ahead (commuication skills, career skills etc), but also has a solid collection of business skills and writing skills advice. Everyone forgets just how important writing skills are, and I mean writing to persuade, which is one of those 'golden skills'. This book has some breezy but nice guides on business and online writing for sure. Coming back to the 'soft skills', people skills matter most, people! You have to be able to get your ideas across, succinctly, and to the right audience. It all starts with being interested in others. Buy this book, Save your career, save yourselves. The title says it all. A No-nonsense, straight-to-the-point guide to doing just about anything to succeed in any career and having a great mindset to survive. Buy it. Read it. Gift it. Finally, someone has given us all we needed to get ahead in one book. This new 'encycploedia of advice' is so useful because it covers not one skills, but almost all of them, and sometime or other, you are going to need some advice from somewhere in this big, big book. I bought this book because I could fit it on my phone. And there is just so much I want to know. Get the book. Do the work. Build better career. This book is about your professional life - not just as an employee, but as a freelancer, or an entrepreneur, or just just anyone of these roles at some points of your life. Thus, it is clear that this encyclopedia is not just a must have for fresh college graduates but for every professional. There are some quibbles, but it is a nice start. And 250+ Work & Perosnal Skills Made Easy is priced well. This is quite simply the most comprehensive and informative book on career advancement and self improvement that I have come across. This book will pay for itself many times. Chalked full of knowledge and insight. One of the nice things about '250+ Work & Perosnal Skills Made Easy is that it straightaway tells you there are no original ideas here, just the best bits from the best books. And that is the original thing about this useful compilation. Get it now. This book will have many editions. - And many more. There are 290 guides!